U.S. Representative John R. Carter was elected in 2010 to his fifth term representing Texas' Thirty-First Congressional District in the U.S. House of Representatives. Since his first election in 2002, Congressman Carter has established himself as a leader in Congress who has the foresight and courage to author and support numerous pieces of legislation that would increase the protection of U.S. citizens and bring justice to those who threaten our freedom and way of life. 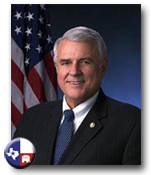 Congressman Carter was also unanimously re-elected in 2010 to a third term as House Republican Conference Secretary. In this position, Congressman Carter is the sixth highest-ranking Republican in the House. He has served on the prestigious House Appropriations Committee since 2004, and currently sits on the Transportation, Homeland Security, and Military Quality of Life and Veterans Affairs Subcommittees. During the 108th Congress, Congressman Carter was a member of the House Education and the Workforce, Judiciary, and Government Reform Committees. Carter also continues to serve on the House Republican Steering Committee, an official group of members who are in charge of placing members on committees. Carter has been honored to serve on this select panel since being elected to Congress. For Congressman Carter, leadership goes far beyond the committee room and onto the House floor, where he has successfully had legislation passed and signed into law under both Presidents Bush and Obama. Bringing to Congress 20 years of judicial experience, Congressman Carter has consistently worked to advance a tough on crime agenda. Congressman Carter bears the nickname of "Judge" on Capitol Hill and at home for serving over 20 years on the bench. In 1981, Congressman Carter was appointed the Judge of the 277th District Court of Williamson County and was elected District Judge in 1982. Before becoming a Judge, Congressman Carter had a successful private law practice and continued to practice law while serving as the Municipal Judge in Round Rock. He was the first county-wide elected Republican in Williamson County history. As an attorney, Carter represented the Round Rock and Williamson County communities through their first booming phases of growth and continues to support and guide today's growth. Congressman Carter has seen the economy both rise and fall and has a plan to assist the residents in Congressional District 31 to ensure their prosperity. A true Texan at heart, Congressman Carter was born and raised in Houston and has spent his adult life in Central Texas. Carter attended Texas Tech University where he graduated with a degree in History and then graduated from the University of Texas Law School in 1969.Congressman Carter and his wife, Erika, met in Holland and have been happily married since June 15, 1968. Since then they have built a home and raised a family of four on Christian beliefs and strong Texas Values.